Not really, but once you’ve experienced the claustrophobia-inducing bus rides, the I’d-rather-chew-on-my-weenis-and-sacrifice-loved-ones-than-stand-here-for-two-days ticket lines, or the, we-have-a-toliet-but-you-can’t-use-it-now-because-we’re-so-overbooked-that-thirteen-people-are-sitting-in-there-for-the-duration-of-the-twelve-hour-ride train rides, you may think my translation is a bit more appropriate. Insert obligatory Waldo comment here. The Lunar New Year is the BIGGEST holiday for Chinese people. Spring Festival (Guo Nian) is the celebration of the new year, and everywhere in China you can see more red than usual, doorway hangers with meaningful and auspicious phrases greet guests as they enter homes, and many kids and business men will receive little red envelopes with crisp, clean bills in quantities of 100-1000 RMB. As the legend—there’s always a legend in China—goes, Nian was a great and terrible monster that harassed a village, eating its people and basically causing the real estate market to crash. He did this for a while until an old man convinced him to switch his diet to other creatures that weren’t…human. The man turned out to be an immortal—there is always one of them running around in Chinese myths, too—and, additionally, told the people how to scare off this beast if he ever returned. Wear a bunch of red, make noise, and light things on fire was his advice, and the Chinese have held true to these sage words so well that, for a week during this holiday, some Dalian neighborhoods resemble what I imagine downtown Baghdad might look like. Sulfur fills the air, conversation is blotted out by explosions, and flashes of light illuminate the sky. And occasionally a pedestrian gets fourth degree burns and street cleaners lose phalanges. Guo Nian, once known as the “passing of the beast,” now mostly just means Spring Festival, but it’s fun to know the source, ain’t it? Stories and myths are nice and all, but when you’re standing or squashed hip-to-hip with smelly strangers or sharing the bathroom with seventy other dudes, you come to learn that a new beast has appeared in China, and like Nian of old, it comes around once a year to ravage even the most civil of citizens—Chun Yun, Spring Festival Travel Rush. 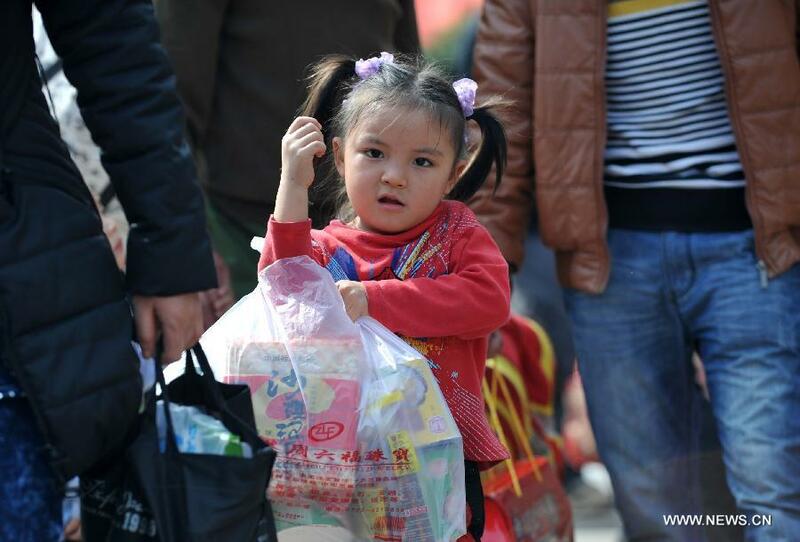 Families, students, migrant workers, and tourists all travel in China during Spring Festival, which usually falls around the first week of February. 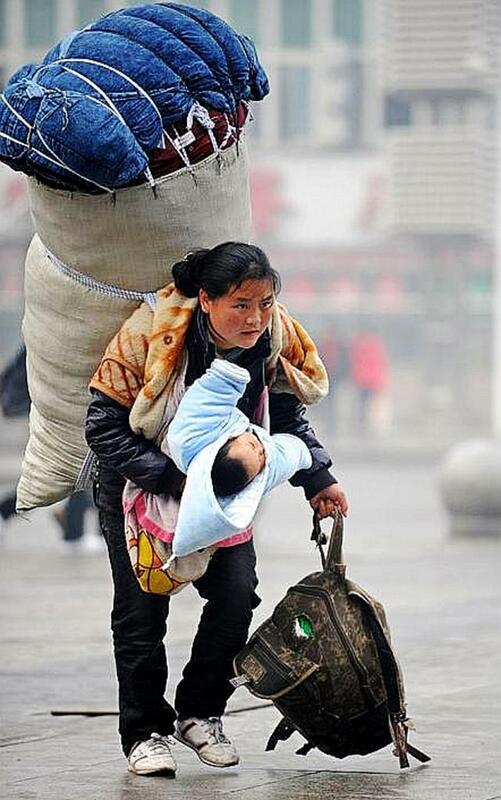 Some will fly, drive, take buses, trains, ferries, or even hitchhike to get back to their dear mom and pop. 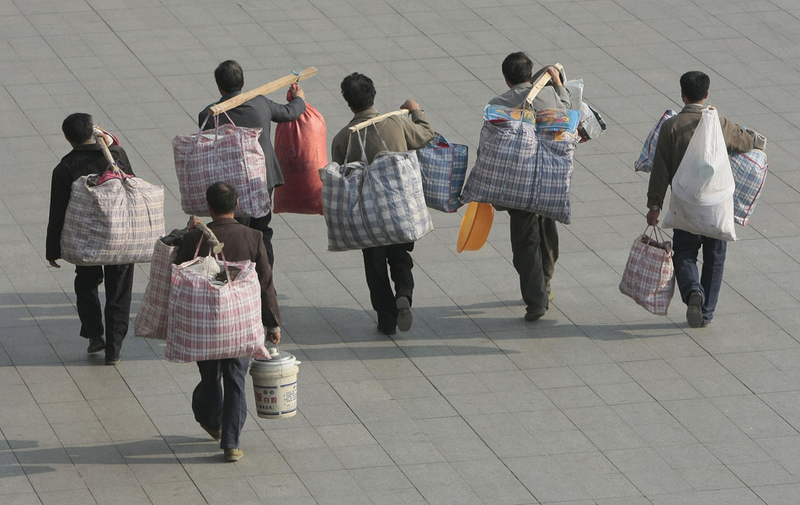 High Ho, High Ho…Yeah, I know, one short.This is the classic bag of the min gong, migrant workers. Airlines here are being, “…instructed to take measure to avoid flight delays as the world’s largest annual human migration…draws closer…”(Wang, Chinadaily.com.cn), but in a country of so many, and a severe pollution problem that routinely grounds and delays flights out of big cities, this “instruction” might just be wishful thinking. 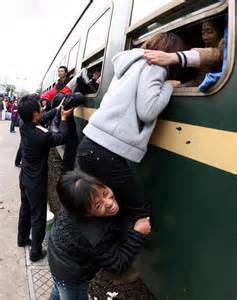 Heck, Shanghai alone is projected to have more than 9.3 million travelers pass through (Chinadaily.com.cn). That number might not seem so scary, but consider that Shanghai is just ONE of hundreds of cities with airlines in China. Still not convinced? Then think about the most popular form of travel: the trains. 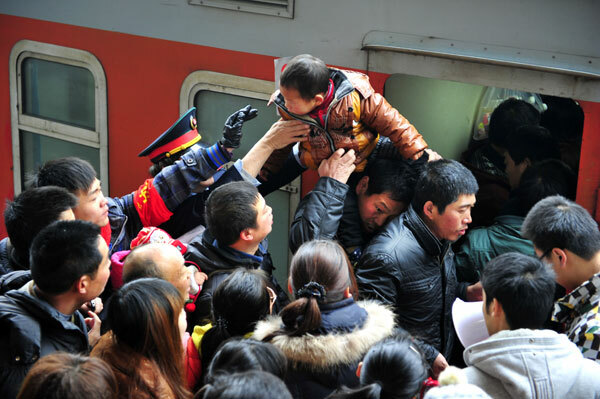 Last year more than 220 million passengers took to the trains, and this year already more than 148 million tickets have been sold for these suicidally filial citizens (Chinadaily.com.cn). At its peak, more than 500 train tickets a second were sold! To put that in perspective—I have no way to cognitively register such a number of sweaty, pushy, humans—in the US this year AAA projected that about 94.5 million people traveled 50 miles or more during the Year-End holidays, and we Americans don’t even like trains—that number is a total for ALL travel forms (Newsroom.com). Less than 100 million compared to more than 220 million…That. Does. Not. Compute. Her brother is already in the luggage compartment. Just stick her in the toilet! Living in China introduces you to myriad situations that test your gumption and resolve, but nothing zaps the will so much as the sheer force of numbers. I’ve avoided markets and stores until I was about ready to boil the leather of my shoes, just to not have to deal with people. I’ve walked a block out of my way instead of allowing myself to become part of the anarchy that is the pedestrian parade crossing the street. 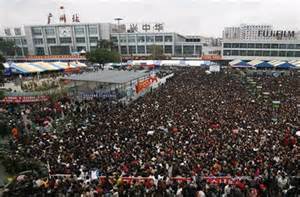 When I see a China-size crowd, I feel like I need a pep talk from Jesus telling me not to take a machete and cull the multitudes. Traditions of traveling back home. Education/Work reforms that promote students attending universities in other cities, and large numbers of workers that travel city to city for work most of the year. Spring Festival, along with the Golden Week of the National Day holiday in October, are two holidays that EVERYONE has off. Because of this, they like to take their trips during these times as well as visit the ‘rents (Coonan, “Two billion journeys in China’s own great migrations”). Oh, crap…I’m going to be traveling, too! !